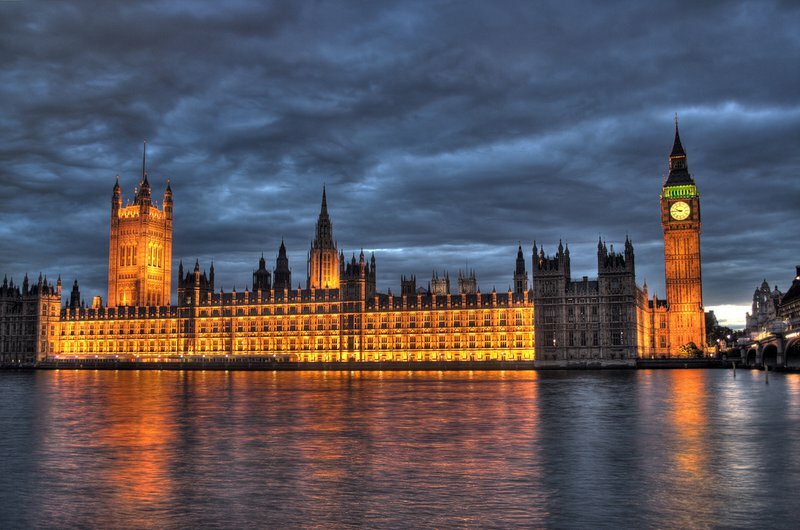 In Britain, hostility to democracy is highest not at the extremes – but in the centre. Radical forces, hitherto marginal, have hijacked Westminster. Such is the prevailing anxiety in post-Brexit politics. Inside the Conservative Party, a small group of Brexiteers hold Theresa May hostage to a hard Brexit, against the preferences of most Tory voters. Inside the Labour Party, a small group of Momentum activists use Stalinist practices to demand loyalty from Labour MPs and councillors. The conventional wisdom is that both ends of the political spectrum present a threat to British democracy, while the centre remains the refuge of the sensible. But the data suggest otherwise. In a new working paper I examine the most recent waves of the World Values Survey and the European Values Survey, which ask respondents from over 100 countries a range of questions about social and political issues. And I find that hostility to democracy is highest not at the extremes – but in the centre. 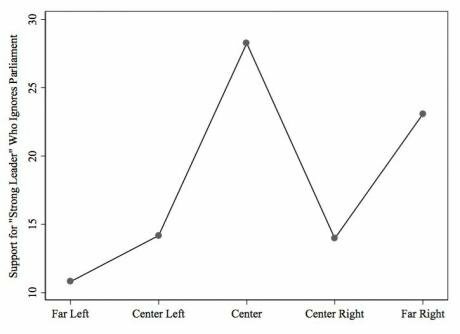 My analysis measures respondents’ left-right position against three different metrics. The first is support for democracy, indicated by the proportion of respondents who believe that democracy is a ‘very good’ political system. The second is support for democratic institutions, indicated by respondents’ view of civil rights and free elections as ‘essential’ to democracy. And the third is support for authoritarianism, indicated by respondents view of a ‘strong man that does not have to bother with parliament’ as a ‘very good’ or ‘fairly good’ system. Across all three, I find that centrists are significantly less supportive of democracy and significantly more supportive of an authoritarian alternative. The British case is one of the most striking. Less than half of British centrists believe that democracy is a ‘very good’ political system, compared with over 60 per cent along the extremes. While the far right remains the most hostile in many European countries, the British centre consistently ranks highest in its disregard for democratic procedure. At this point, some survey skeptics might balk: it is possible that respondents place themselves at the centre when they are confused, or when they do not care enough to take sides. I address this possibility in three ways. First, the survey includes a “Don’t Know” response to left-right placement, which I exclude from the analysis. Second, the survey includes several policy questions – including views of immigration and preferences over equality versus freedom – which I test against respondents’ left-right placement. 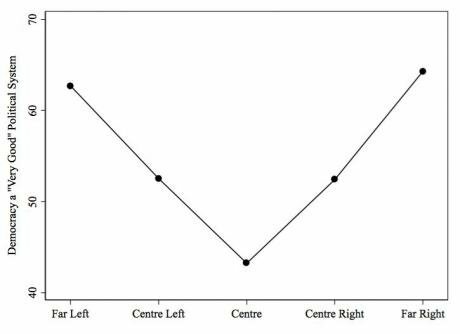 I find that self-placement closely predicts policy views, with centrists preferring the moderate position. Finally, I re-run all my analysis on the sub-sample of non-apathetic respondents who identify as “Very” or “Somewhat” interested in politics. I find that the same trends hold – especially in the British case. But the question of methodology largely misses the point. A prominent assumption in British politics is that there is a silent majority of moderates – people who understand themselves as moderates – who are, by dint of their moderation, committed to democratic ideals. But that assumption is based on a one-dimensional model of politics. According to this model, voters exist on a single spectrum from left to right, and all of their policy positions align there, too. In other words, voters’ views of wealth redistribution are lumped together with their views of free and fair elections. This one-dimensional model suggests the centre as the natural home for pro-democratic support. In reality, though, there are good reasons to believe that citizens with moderate policy positions might also be hostile to democracy. One reason is apathy. 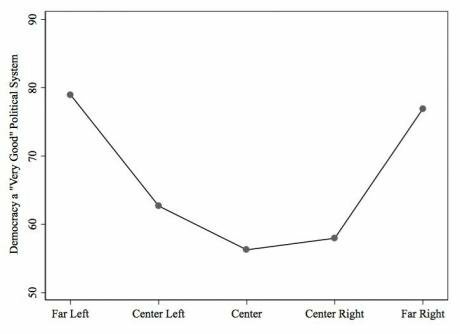 As Alan Abramowitz argues in The Disappearing Center, centrist voters tend to be less politically engaged than polarized ones. But even non-apathetic moderates might choose to reject the messy business of democracy in favour of a more enlightened authoritarian regime – particularly in polarized times like these, when the democratic process has ratified extreme policy positions and ushered extreme candidates into office. My analysis finds that support for a "strong leader" that ignores parliament is highest among centrists in Britain. What are the implications of these findings for the state of democracy and its prospects for survival? One is that the centre is not a safe zone. If Britain continues to move toward a hard Brexit, Remain moderates may be tempted to constrict the democratic will in order to get their way. In Italy, we have just witnessed a textbook case of authoritarian centrism, as the pro-establishment president blocked the formation of an anti-establishment government. The same could happen here. For centrists who are also committed democrats, then, these findings should be particular cause for concern. If the centre must hold against a rising tide of false populism, then centrists must fortify it – engaging with moderate voters to renew their faith in democratic politics, rather than assuming their like-mindedness. In the effort to safeguard liberal democracy, though, they have unlikely allies. The assumption, debunked here, that radical politics are anti-democratic has led some moderates to reject candidates that call for radical change. But there is nothing incompatible between strong political views and commitment to democratic process. We might, then, finally abandon our assumptions about which groups pose a threat to democracy — and start looking at the actual policies and practices that define them.